The prominence of religion in recent debates around politics, identity formation, and international terrorism has led to an increased demand on those studying religion to help clarify and contextualise religious belief and practice in the public sphere. 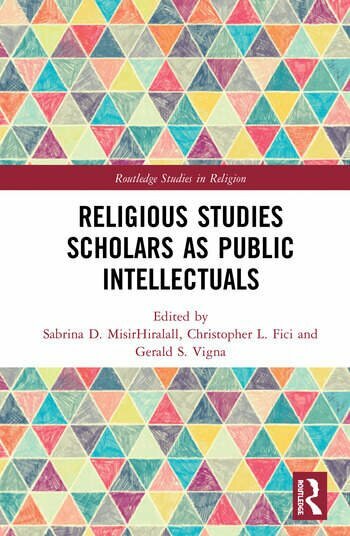 While many texts focus on the theoretical development of the subject, this book outlines a wider application of these studies by exploring the role of religious studies scholars and theologians as public intellectuals. This collection of essays first seeks to define exactly what makes an intellectual "public". It then goes on to deal with a few questions of concern: How do public intellectuals construct knowledge in religious and theological scholarship? What is the link between public intellectuals of higher education and their role in society? Do higher education institutions have a responsibility to endorse public intellectualism? Looking at the individual and collective role of religious studies scholars and theologians in public life, this book will be of great interest to all scholars and academics involved in religious studies and theology across the academy. 2 The Future of Religious and Theological Studies: What Is Our Responsibility as Public Intellectuals? 14 Public Intellectuals at the Dawn of the Anthropocene Age: Can we ReMember? Sabrina D. MisirHiralall, Ed.D. received her doctorate from the Pedagogy and Philosophy Program at Montclair State University. Recently, she published Confronting Orientalism A Self-Study of Educating Through Hindu Dance. She serves as Regional Coordinator on the Executive Board of the Mid-Atlantic Region of the American Academy of Religion. Christopher L. Fici is a Ph.D candidate at Union Theological Seminary in New York City. He serves currently as the President of the Mid-Atlantic American Academy of Religion, as well as Co-Chair within that region for the Comparative Religion and Ecology section. Gerald S. Vigna is Associate Professor of Theology at Alvernia University in Reading, PA. He completed undergraduate and graduate degrees at Temple University and Northwestern University respectively. Currently, he is Vice-President/President-Elect of the Mid-Atlantic Region of the American Academy of Religion.